The Black Caps are closing in on their most dominant test victory of all time, and a record winning streak. These, truly, are New Zealand cricket's halcyon days. Another incredibly lopsided day at Hagley Oval has put the hosts just eight wickets away from a test and series-clinching victory – a win that would secure an unprecedented fourth straight series triumph. Frankly, anything else would be the greatest shock in cricket history, considering the monumental task facing Sri Lanka after they were swatted all over the ground on day three. 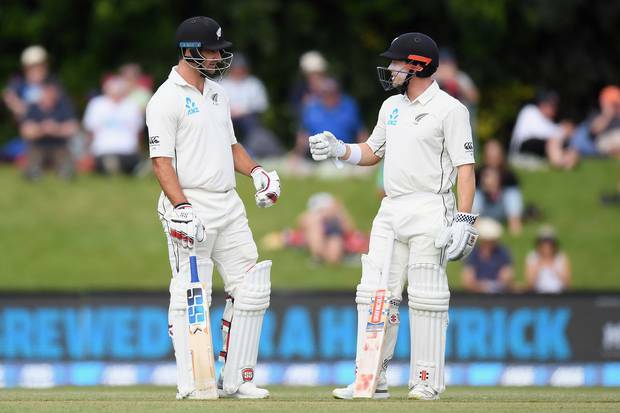 The Black Caps racked up a staggering 585-4, with Tom Latham (176) and Henry Nicholls (162 not out) batting the visitors completely out of the test, before Colin De Grandhomme (71 not out from 45 balls) twisted the knife with New Zealand's fastest test fifty. It all seemed rather cruel, with Black Caps captain Kane Williamson biding his time before eventually calling in his troops when their lead hit 660 – setting the eighth largest target in test history. Unlike in Wellington, where they went a day without losing a wicket, surely this time there is no hope left for Sri Lanka. They lost both their openers in the 14 overs before stumps, there is no rain forecast to save them, and thus they have to bat for two straight days. It won't happen. It can't happen. Another record-setting conclusion is the more likely outcome - if you want to get ahead of yourself, consider that since 1934, no team has won a test by more than 500 runs. At worst, New Zealand's biggest test victory – 254 runs – is surely set to be broken, following a day in which plenty of records tumbled. Let's start with Tom Latham. The 26-year-old has truly cemented himself as the opener of the future, becoming the first New Zealand opener to reach 150 on three occasions. Resuming on 74, he again looked at ease at he slowly ground his way to his eighth test century from 267 balls, bringing it up with a cut to third man, and saluting his teammates. Latham ended up facing 889 balls this series – the most by a New Zealand batsman in two-test series, and in the midst of it all, he became the first New Zealander since Brendon McCullum to reach 150 in consecutive tests. He added 214 for the fourth wicket with Nicholls, who promptly continued the onslaught when Latham finally departed. It was a day, and an innings, where everyone contributed for the hosts. All of the top six reached 40 – for just the second time in New Zealand test history, and all five partnerships were of 50 runs or more, a New Zealand first. Nicholls was involved in two of them, and brought up his third century of the year with a chanceless innings. And, just when everyone expected a declaration, he came back after tea to reach his highest test score. It seemed as milestones were being racked up every over, and de Grandhomme only added to Sri Lanka's demise. He brought up his record 50 off 28 balls – one ball faster than Tim Southee's effort on debut in 2008 - and he and Nicholls added an unbeaten 124 in just 87 balls. Finally, Williamson put the Sri Lankan bowlers out of their misery, but the pain wasn't over for the batsmen. Dimuth Karunaratne was caught down the legside for a second ball duck, and Danushka Gunathilaka was caught behind needlessly swiping for four. Dinesh Chandimal and Kusal Mendis saw them through to stumps at 24-2, ending a dire day with a meek moral victory. Alas, it will be the only victory Sri Lanka will claim.